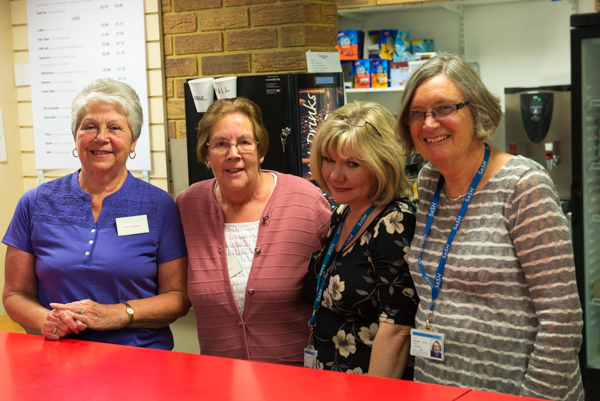 Our newly refurbished coffee shop, at the East Entrance is manned entirely by volunteers. We always are looking for reliable, cheerful people to work in our shops. We run 3 shifts per day, 9.30-12.30, 12.30-3.30, 3.30-6.00 Mon- Fri 10-12, 2-5 on Saturday 2-5 on Sunday. Most of our volunteers work every fortnight, or every month, some every week. On Monday afternoons stock is delivered and we need strong men to unload and others to do checking and pricing. During the Christmas Season, Christmas cards and diaries are also sold in the shop. If you think you could help with this valuable work, you will make new friends and support visitors and patients at the hospital. For anyone on the point of retiring or with some time on their hands, I would strongly recommend voluntary work in one of our shops’. Students with time in the evening, or Saturday or Sunday are also very welcome to apply. For those doing the Gold Duke of Edinburgh Award this would fulfil the requirements of the Service Section.